Have you ever wandered through the galleries at the DMA and thought to yourself, “Hmm, I wonder how they got this huge sculpture up those steps?” or “Wow! I bet it was really hard to hang that giant painting!” If you have, this post is for you! In one of the DMA’s newest installations, Women + Design: New Works, there are several pieces that required significant effort on the part of the DMA’s Collections team to install. Check out these behind-the-scenes photos and fun facts from the installation process, and visit the Museum to see these works in person—and for FREE—now through Sunday, February 17, 2019, in the Mary Noel and Bill Lamont Gallery. Objects Conservator Fran Baas adjusts the laser-cut polyester lace on Iris van Herpen’s Voltage Dress. A team of preparators works on lowering the two pieces of Najla El Zein’s Seduction onto the platform. Each piece of the sculpture weighs approximately 1,500 pounds and needs to be moved with a gantry crane. The lower stone was placed first, and then the upper stone had to be carefully lowered onto it. Fran Baas, Lance Lander, and Mike Hill review the instructions for assembling Faye Toogood’s Tools for Life Mobile 2. Because the components of the mobile are heavy, the team had to know exactly what to do to minimize unnecessary handling. Mike Hill and John Lendvay work to assemble Tools for Life Mobile 2 as it hangs from the ceiling. Doug Velek takes measurements for the two pieces of jewelry by Katie Collins. Prior to installing the work, the preparators made the wedges and lifts used to display the jewelry in the exhibition. After confirming that the necklaces were centered on the wedge, preparators used pins to secure them in place. Curator Sarah Schleuning and preparator Russell Sublette discuss the placement of the three stools by Faye Toogood. Katie Province is an Assistant Registrar for Collections and Exhibitions at the DMA. It may or may not surprise you to hear that one in five adults in the United States self-identifies as having a disability. At the DMA, we believe that limitations reside not in individuals, but in systematic barriers to participation, and that accessibility is a shared responsibility across the Museum. Collaboration between departments helps the DMA remove barriers to participation and continually broaden our definition of access. One of the ways we approach accessibility is through individualized experiences for specific needs. But we also learned from visitors that they’d like the means to explore the Museum and its collection through unstructured, anytime activities and resources. This month we are pleased to unveil the result of the most recent collaboration between our Education and Design departments: large-print booklets in the Center for Creative Connections Gallery. When designing for the low-vision community, the proper treatment and application of design elements can significantly enhance readability. Simply enlarging standard-print documents does not result in effective large-print material. The font selection, size, and line spacing are just a few components that must be carefully selected and treated. Sans serif geometric fonts such as Helvetica, Futura, and Gotham Rounded are ideal for large-print documents. Limiting the number of characters per line, creating a high visual color contrast between the background and text, and aligning to the left are further design decisions that help the low-vision community easily consume printed information. While visitors with vision impairment were at the forefront of our mind during the design process, these design elements can help remove barriers for visitors with dyslexia and those who are English language learners as well. We are excited to add these large-print booklets to our repertoire of accessible materials for visitors. Some of our previous projects include visual descriptions and sensory activities at the Pop-Up Art Spot. Creating opportunities and programs for visitors with vision impairments has long been an important facet of the DMA’s program offerings with Art Beyond Sight Awareness month in October and our summer touch tour for DISD students with visual impairments. While many exciting accessibility projects are underway at the Museum, there is still much work to be done. As we evaluate and test the new large-print label format, we will seek to expand the booklets to other exhibition galleries in the future. We hope the introduction of the large-print label booklets will be a next step in exploring what we can do to better serve our audiences and expand accessibility throughout the Museum. Emily Wiskera is the Manager of Access Programs and Jaclyn Le is the Exhibitions Graphic Designer at the DMA. Did you know that Arturo’s Nest (the Museum’s play space just for children 0-4 years old) is nine years old?! The first kids to step foot in this beloved space have long since outgrown it! When the space opened in 2008, it was a new experiment for the Dallas Museum of Art, and a visible symbol that we love little kids here at the Museum. Since that time, this small room has had a BIG impact. It is one of the most visited spots in the Museum for children and families, and you can almost always hear squeals of laughter trickling out from the room. A few weeks ago, we closed Arturo’s Nest to give it a much-deserved redesign. Chip & Joanna Gaines didn’t visit, but our crack team of designers, educators, and carpenters worked their own “fixer upper” magic and gave the Nest a whole new look. Ready to see what we’ve done? How about we first take a look at where we’ve been. And…drum roll please…Arturo’s Nest in 2017! What do you think? One of my favorite parts of the design is that we see both a daytime and a nighttime view of Arturo’s home. And that fun polka dot carpet will make it so much more comfy for kids to sit down and play. We’ll be adding even more features in the months to come, so be sure to come visit throughout the summer. Arturo can’t wait to see you! Are you dreaming of lazy days at the swimming pool, sunburned noses, family vacation, and popsicles? We are! Summer is officially 95 days away, but we won’t be spending it at the neighborhood pool. For those of us who coordinate Family Programs at the DMA, summer means one thing—Summer Art Camp! And this year’s line-up of camps has something for every creative kid. Whether you are a junior shutterbug, fashionista, sculptor, painter, designer, musician, actor, or inventor, there’s a summer camp for you. I have been teaching summer camps at the DMA for five years now, and I’m 95 percent serious when l tell my friends that I would gladly be a full-time summer camp teacher. I love spending an entire week with a group of kids, exploring the Museum’s galleries, getting messy in the studio, and having fun. Summer camp gives both teachers and campers permission to be a little goofy, experiment with materials in crazy ways, and give our creativity a good work-out. Camp is all about F-U-N (but we usually manage to learn something along the way too). This year’s camps will be held each week June 9-27 and July 7-August 15. Morning camps are 9:00 a.m.-noon and afternoon camps are 1:00-4:00 p.m. Tickets are on sale now! For aspiring art and museum educators, Summer Art Camps also offer the opportunity for a summer internship at the DMA. Summer camp interns get hands-on experience as they assist summer camp teachers by facilitating gallery activities, art-making projects, games, and sensory explorations. With each camp, interns step into the role of art cheerleaders, skit-planning co-conspirators, the ultimate problem solvers, and mentors to the children. What better way to spend a summer? Applications are now being accepted. Find out how to apply here. Spend some time with us this summer at the DMA, and you’re sure to be a happy camper! 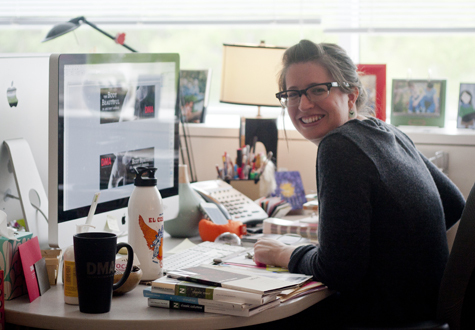 Uncrated stopped by the design office and caught up with Becca Winti, Senior Graphic Designer, to learn more about her role here at the DMA. Rumor has it that she can do a perfect goat impression . . . Describe your job in fifty words or less. I provide design for print, environmental, and web-based communications for the Museum. Projects consist of brochures, invitations, ads, store product, way-finding signage, banners, billboards, DART bus graphics, and more. I carry the brand across all of the departments of the Museum to create a visual culture. What might an average day entail? I’m usually juggling anywhere from thirty to sixty jobs at one time, so my average day consists of a lot of multi-tasking! I go from working on a logo for a special exhibition to working on a vinyl “No Smoking” sign for our glass doors. Since I design print projects, I also attend many press checks. I work in a room with two other designers and an editor, which results in a lot of laughing and listening to music throughout the day. Never a dull moment! How would you describe the best part of your job and its biggest challenges? The best part of my job is that ART is my client! I also enjoy working with the different types of people that Museum life is filled with. Working as an in-house designer and creating collateral for different departments in the Museum that looks the same but feels different can be tricky. Each department wants to stand out. So the challenge is how to make them stand out but fit into our over-arching brand umbrella. Growing up, what type of career did you envision yourself in? Did you think you’d work in an art museum? I originally went to school to study architecture but soon realized that there is a lot of math and physics involved and that wasn’t going to work for me. So I made the migration to design communications. I didn’t realize that I could work for an art museum until I was about to graduate from college and saw representatives from the DMA at a student portfolio show that I attended. I worked for a design agency for a year or so straight out of school and then wanted to move on. I decided I would only stay in Dallas if I could work at the Dallas Museum of Art–and look what happened! I got my dream job and I‘ve been here for almost seven years. What is your favorite work in the DMA’s collection? It’s hard to have one favorite work. So I have a few. The first work that stands out in my mind is Buildings by Charles Demuth. I like anything that is architectural, and I love how vibrant the red is. I also really enjoy The Gentleman by Andrew Wyeth. The light that is captured is breathtaking. The work is dramatic but peaceful at the same time. Another favorite is Emma-O. He is so terrifying but that is what I love about him. The artist was successful in creating the King of Hells and evoking the emotion that you get from looking at him. Is there a past exhibition that stands out in your mind as a favorite, or is there a particular upcoming show you’re looking forward to seeing? Past exhibitions that have stood out for me (of course there isn’t just one) are Phil Collins: the world won’t listen, Take Your Time: Olafur Eliasson, Mark Bradford, The Fashion World of Jean Paul Gaultier: From the Sidewalk to the Catwalk, and Posters of Paris: Toulouse-Lautrec and His Contemporaries. Last Saturday, a dozen teachers explored exhibition design in a half-day teacher workshop, slipping in and out of the galleries before the crowds waiting for one last look at The Fashion World of Jean Paul Gaultier: From the Sidewalk to the Catwalk. We were thrilled to have Jessica Harden, DMA Exhibition Design Coordinator, take us through various galleries she had designed. As we looked at the work, she enlightened us on the effect of design elements on visitor experience. It was especially exciting to hear Jessica explain her creative process for the Gaultier exhibition, which is full of imaginative elements, such as a satin-tufted display case and graffiti-filled walls! The teachers spent the second part of the day designing mini exhibitions of works in the DMA’s collection. They considered lighting, wall color, interactive components, mood, and object and visitor safety, pinning their layouts and ideas to project boards. The teachers ended the day by sharing how their chosen design elements expressed the focus of their exhibitions. Here’s the breakdown of our Exhibition Re-design Project. Enjoy these photos that capture some of our fun morning. Thanks to all the teachers who joined us on Saturday! This past December, the Tower Gallery on the fourth floor of the Museum became home to Form/Unformed: Design from 1960 to the Present. This exhibition showcases over thirty works drawn largely from the Museum’s collections and reveals the ever-evolving formal aesthetics and ideas that have influenced design of the last fifty years. Featuring everything from room dividers to candlesticks, the space pays homage to design powerhouses such as Verner Panton, Frank Gehry, Donald Judd, and Louise Campbell. Though a broad array of objects appear in the exhibition, one cannot help but notice an overwhelming number of chairs! Like Goldilocks entering the three bears’ home, we are presented with a selection of chairs ranging across all shapes and sizes. As our exhibitions currently have a heavy empahsis on design, with Gustav Stickley and the American Arts & Crafts Movement and Line and Form: Frank Lloyd Wright and the Wasmuth Portfolio, the Education staff began brainstorming how our society describes furniture and what appeals to us about various pieces. In an effort to find the chair that is JUST RIGHT for you, here are some of the descriptors that may appear on any one of our wish lists for the perfect chair: organic, innovative, angular, minimal, sturdy, plush, colorful, weird, comfy, casual, simple, unique, futuristic, traditional, embellished, symmetrical, asymmetrical, functional, imaginative, elegant, versatile, compact, playful, practical, nostalgic, modern….As you can see, there are as many different ways to describe a chair as opinions on what qualities make the perfect chair! What words describe your ideal chair? Share with us in the comments section! Form/Unformed: Design from 1960 to the Present will run through January of 2012 and is free with general admission to the Museum.